Microwave cavity characterization complements TDR Dielectric Spectroscopy in low-loss materials, providing high-resolution permittivity and loss data at specific single frequencies. 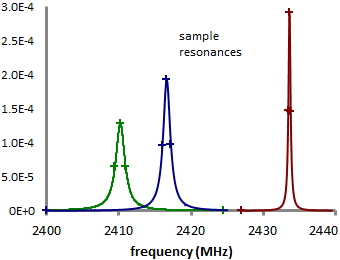 Since measurements do not change significantly with frequency in low-loss materials (Kramer-Kronig relation) cavity measurement at select frequencies provides a full characterization across the RF/microwave range. For characterization in wireless applications, cavity measurement covers key regions in the present-day communications spectrum. Large cavities cover the 850 MHz (North American) and 900 MHz (International) cellular bands, the 1900 and 1800 MHz PCS bands, as well as the newer 4G/LTE bands. Medium-sized cavities cover the 1575 MHz GPS band and the 2450 MHz 802.11 / WIFI band, also used for commercial microwave heating. Smaller cavities cover the newer 5000 MHz 802.11n / WIFI band, as well as 12,000 MHz satellite-TV bands. 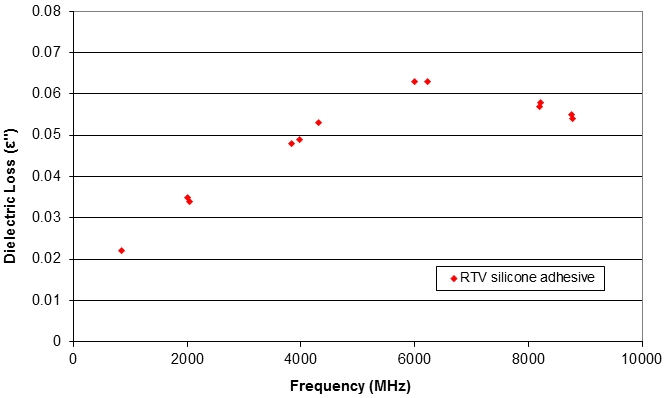 RF characterization of plastics/ceramics for wireless applications. Characterization of insulation losses for cable-TV/LAN applications. Material diagnostics for specialty low-loss ceramics. Characterization of adhesive, cosmetic, and pharmaceutical materials. MSI provides cavity measurement from 1 GHz to 10 GHz in accordance with standard ASTM methods [D2520, etc.]. The dielectric constant - or real permittivity - is measured anywhere from 2-4 for plastics to around 10-20 for ceramics, with 2-3 digit resolution. The dielectric loss - or imaginary permittivity - is resolved down to 0.01 or less. Also the loss tangent - the ratio of the real to imaginary permittivity - is resolved to the order of 0.001 or less. The measurement is non-contact, with results depending only on the change in resonance frequency and width and sample volume. The principle of cavity measurement is straightforward. A conducting metal cavity is constructed, with inner dimensions producing a standing-wave resonance at the frequency of interest. The cavity is connected to an external signal generator and power meter through launching ports located on the side or top/bottom surfaces of the cavity. The signal generator is swept across a range of frequencies, with the power meter recording the detected power as a function of frequency. The cavity is first measured empty, recording the resonance frequency and width, and then measured again with the sample material stood vertically at its center. The real permittivity is then calculated from the change in resonance frequency, with and without the sample, and the imaginary loss calculated from the change in resonance width, with and without the sample. Each sample is placed vertically at the center of the cavity, spanning the full cavity height, thus feeling the maximum electric field. Cavities can be fabricated with either rectangular or circular geometry. MSI generally uses circular geometry, since the latter has better performance and with lower machining costs. By machining circular cavities from a single copper block, precision joining of sidewalls is eliminated, where imperfect sidewall contact can degrade cavity Q.
where X01 is a Bessel-function zero, r the cavity radius, h cavity height, ε and μ the permittivity and permeability of free space [3,4]. For the TM-010 mode in circular cavities, X01=2.405 and q=0, and the equation predicts all the resonant frequencies below. Our model 9450C circular cavity is shown below. The cavity is 93.6 mm inside diameter and 50 mm high, and has a resonance frequency of 2453 MHz, as calculated above. This corresponds to the international frequency for 802.11 wireless internet, as well as commercial microwave heating. The cavity is made from McMaster alloy 101 oxygen-free copper and has a 1 um coating of durable gold to prevent surface tarnish. The cavity has a removable lid for placing and removing samples, and a clamping arrangement for holding the lid securely. Signals are launched from a B-field loop mounted on the cavity side, and detected with an E-field probe mounted on the cavity lid, ensuring that only TM-010 modes are detected. Robust N-type connectors connect to external signal generators and power meters, which in turn are controlled by our automated software. The cavity has a Q over 8000. If the appropriate sample width is uncertain, send several samples of the smaller width and we will stack them together as needed. For sheet materials, cut several strips with the appropriate width and we will bind them together with a light thread to form the necessary volume. If the samples are slightly irregular in shape, send the material density and we will weigh on a microbalance and determine the volume from the mass/density relation. For liquid materials, send an appropriate volume we will fill a small PTFE container and measure, using the empty cavity and PFTE container as the empty-cavity reference. 2450 MHz Polymer Measurements A microwave cavity measurement for a typical polymer material is show below. 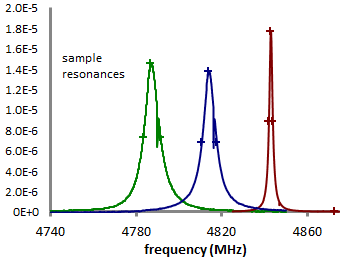 On the right is the empty-cavity resonance for the model 9450C. 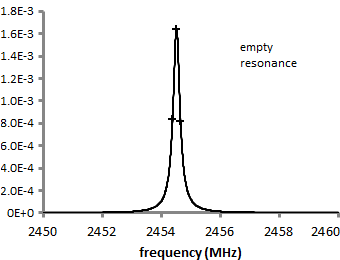 As seen in the figure, the cavity has a resonance frequency of 2454.515 MHz and a Q of 8925, where the peak frequency and full-width-at-half-maximum are automatically marked and displayed in the legend. The empty cavity volume, calculated from 2π·r2·h, is 344.0 cm^3. On the left is the cavity resonance for Teflon and 2 polymer samples, inserted individually and stood vertically at the center of the cavity. The Teflon sample is round, 49.9 mm long by 6.32 mm in diameter. The 2 polymer samples are rectangular, 50.0 mm long by 4.9 x 4.9 mm in width. The sample volumes are calculated from 2π·r2·h or l·w·h, depending on sample geometry. 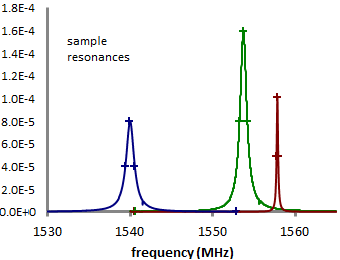 The resonance frequency for each sample is marked and displayed in the legend, as well as the cavity Q and sample volume. As seen in the legend the permittivity for Teflon is slightly above 2, consistent with the literature, with an extremely low loss tangent. The permittivity for the 2 polymer samples is in the 3-4 range, typical of most polymers, with a loss tangent varying between the 2 materials. 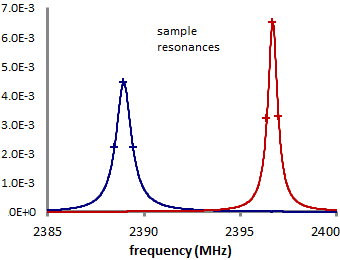 2450 MHz Ceramic Measurements For ceramic materials, permittivities are typically in the range of 9-12 with low loss. 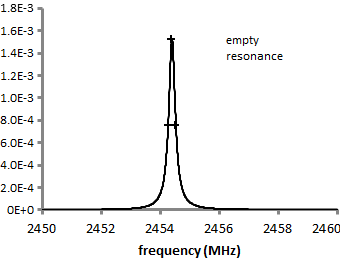 Below on the right is the empty cavity resonance for the 2450 MHz cavity, essentially the same at 2454.395 MHz with a Q of 9261. Both test samples are now smaller, to compensate for the higher permittivity. Ceramic 1 is 50.0 mm long by 3.0 x 2.8 mm in width, while ceramic 2 is 50.0 mm long by 3.0 x 3.1 mm in width. The resonance frequency for each sample is marked and displayed in the legend, along with the cavity Q and sample volume. As seen in the legend, the permittivity both samples is in the range 11-12, with extremely low loss. This is consistent with expected results for ceramic materials. 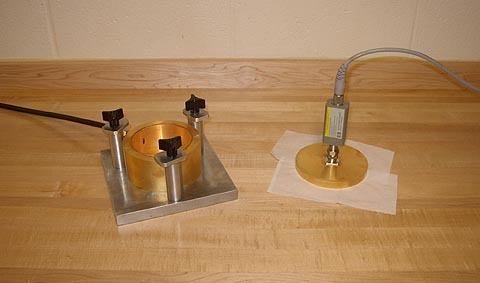 1575 MHz Polymer Measurements Measurement can be done at other frequencies by varying the cavity diameter. 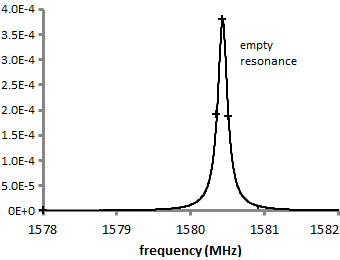 Below is a measurement at 1575 MHz, the international GPS frequency, using the same polymer materials described earlier. The cavity is now larger, 145.0 mm in diameter, as predicted by Equation 4. Since this is a different cavity it provides an independent check of 2450 MHz results, and since the cavity frequency is lower we expect the real permittivity to be the same or slightly higher, in accordance with standard rules of dielectric relaxation in solids. This can be verified by comparing the 1575 measurement with the 2450 MHz polymer measurement described earlier, showing the real permittivity to be essentially the same. Though the relative resonance shift for the two polymers is different, since the relative volumes are different, the volume ratio Vo/Vs compensates for this Equation 1, such that the permittivities are the same. 5000 MHz Polymer Measurements Similar measurements can be done at 5000 MHz, the new WIFI-N frequency. Here cavity diameter is smaller, 45.8 mm diameter, as predicted by Equation 4. The required sample size is also smaller, to keep the volume ratio Vo/Vs reasonable and not overload the cavity. The measured permittivity is slightly lower, comparing the 5000 MHz measurement with the 1575 and 2450 MHz measurements described earlier. Again this is consistent with standard rules of dielectric relaxation in solids. MSI has a variety of microwave cavities for different frequency ranges. Some of these are listed below according to frequency, diameter, and cavity height. All measurements are done with the sample stood vertically at the center of the cavity, so it is important the sample length not exceed the cavity height. The sample length should be as close as possible to the cavity height, without going over. In addition, recommended cross-sectional dimensions are given for various frequencies and materials. Samples can be either round or square, provided the cross-sectional area is comparable. For polymers, whose permittivity is generally in the 3-4 range, we recommend a larger diameter/width than ceramics, whose permittivity is generally in the 9-12 range. Materials whose permittivity is expected to be higher should have an even smaller diameter/width. Combined Cavity Measurements In most solid materials, the dielectric properties do not change significantly at microwave frequencies. 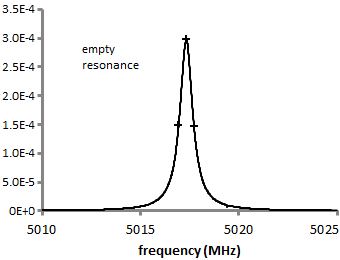 Thus measurement at select frequencies, such as 1575, 2450, and 5000 MHz, provide a full characterization over the relevant range. However if desired, we can perform measurements at multiple frequencies and combine to provide a more detailed dielectric spectrum. An example is show below for a low-loss RTV silicone adhesive. Here results from 7 different cavities are combined to show a weak dielectric loss peak over the range 850 MHz to 9010 MHz. A. W. Kraszewski, S.O. Nelson "Resonant Cavity Perturbation - Some New Applications of an Old Measuring Technique", Journal of Microwave Power and Electromagnetic Energy, Vol 31, page 178 (1996). Anand Parkash, J.K. Vaid, and Abhai Mansingh, "Measurement of Dielectric Parameters at Microwave Frequencies by Cavity Perturbation Technique", IEEE Trans. Microwave Theory and Techniques, Vol. 27, No. 9, 791 (1979). Samuel L. Liao, Microwave Devices and Circuits, Prentice-Hall, New Jersey (1980). ε = 8.85·10-12 F/m, μ = 4π·10-7(V·s)/(A·m). Copyright © 2015 Material Sensing & Instrumentation, Inc.